The finding that made headlines from this week’s Census Bureau release of new national and state population estimates—that there are now more deaths than births among non-Hispanic whites—is a vivid illustration of the rapid long-term growth in the number of older Americans. But first, you might ask, how could there suddenly be more deaths than births, given that American lifespans are so long? One key reason is that U.S. birth rates and the number of births have dropped since the onset of the Great Recession in late 2007, and non-Hispanic whites also have a below-average birth rate. 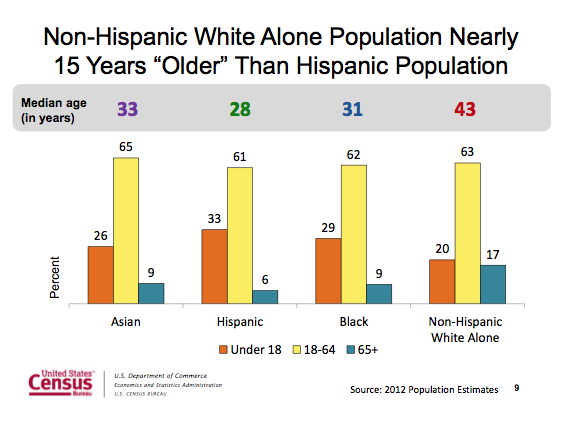 Another reason is the age makeup of the non-Hispanic white population: It is older than other groups (see chart) and includes a lower share of women in their childbearing years. For now, the non-Hispanic white population is still growing because of immigration from abroad. But both the Census Bureau and the Pew Research Center have forecast that the number of white non-Hispanic Americans would decline in coming decades, as the death-to-birth ratio grows faster than could be offset by immigration. The recent fertility downturn may have sped up the growth of the death-to-birth ratio. From July 1, 2011 to July 1, 2012, the Census Bureau estimates there were about 12,000 more deaths among non-Hispanic whites than births. Non-Hispanic whites are the bulwark of the nation’s giant post-World War II Baby Boom generation. The first of this group turned 65 in 2011, and 10,000 a day are forecast to do so in the coming decades, through 2029. The Census Bureau recently projected that the share of Americans ages 65 and older would rise to 20% by 2030, compared with 13.7% in 2012. The working-age population, people ages 18 to 64, is projected to decline as a share of the total, as is the share of children. Are minority births the majority yet?